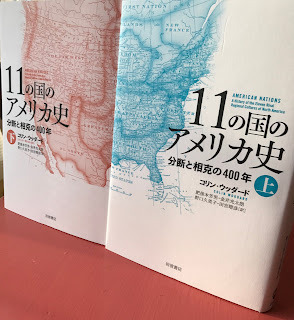 Just as my son's first grade class was embarking on a unit on Japan a couple weeks ago, what should arrive at our front door but a package from Tokyo containing the handsome new Japanese edition of American Nations: A History of the Eleven Rival Regional Cultures of North America. Publishers Iwanami Shoten took particular care in creating their edition, which appears in two hardcover volumes, even asking if I could write an updated, Trump Age introduction for the Japanese audience, which I was delighted to do. Co-translator Yoshio Higomoto and was a pleasure to work with. The book looks to have been published in mid-October, though I missed that at the time.